For people who have large collection movies and wish to store them in one place and then conveniently stream and watch the media on any devices you own right from the Internet, Plex Media Server can be your best choice. However, the media formats can be in various formats, it very likely that your Plex Media Server will fail to read that formats or transcode that formats for your streaming devices. For example, a DVD movie, an ISO image file or other incompatible file formats and types. Fortunately, here comes a free and powerful video transcoder - Handbrake, which can transcode video and audio from nearly any format to a handful of modern ones. Moreover, it also helps to make ripping a film from a DVD to data storage devices easier. The following article will show you how to set the options and change the settings with Handbrake to encode videos for Plex playback. 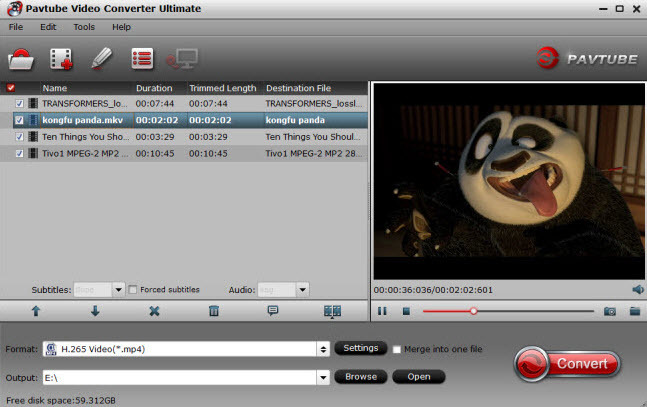 Therefore, if you are looking for a simple to use media transcoding program that can work with various media types, encode more video formats with fast speed by utilizing the GPU encoding acceleration, we highly recommend Pavtube Video Converter Ultimate to you. This cross-platform application is available on both Windows and Mac platform (get Mac version). It can assists you to convert virtually all digital file formats including AVI, WMV, MP4, H.264, MOV, FLV, MKV, ASF, 3GP, XAVC/XAVC S, Prores, H.265, MXF, AVCHD, etc and also commercial Blu-ray disc/BDMV folder/ISO image and DVD Disc/Video_TS folder/IFO/ISO image file to Plex supported file formats listed above. To get the best Plex playback settings, you can flexibly adjust output profile parameters including video codec, resolution, bit rate, frame rate and audio codec, bit rate, sample rate, channels, etc to make them adapt with Plex Media Server. Different from Handrake, the program offers various output file formats including AVI, WMV, MP4, MOV, FLV, 3GP, ASF, VOB, etc and codec such as MPEG-1, MPEG-2, MPEG-4, H.264, H.265, DNxHD, Prores, M2TS, etc to satisfy your different needs. What's more, the Windows version - Pavtube Video Converter Ultimate supports hardware encoding acceleration, you can get up to 6x faster H.264 codec encoding speed as long as you run your PC on Graphic cards that support Nvidia CUDA or AMD App and up to 30x faster H.265 codec encoding speed as long as you run your computer on Graphic cards that support Nvidia NVENC technology. How to Convert Blu-ray/DVD/Video for Plex with Handbrake Best Alternative? 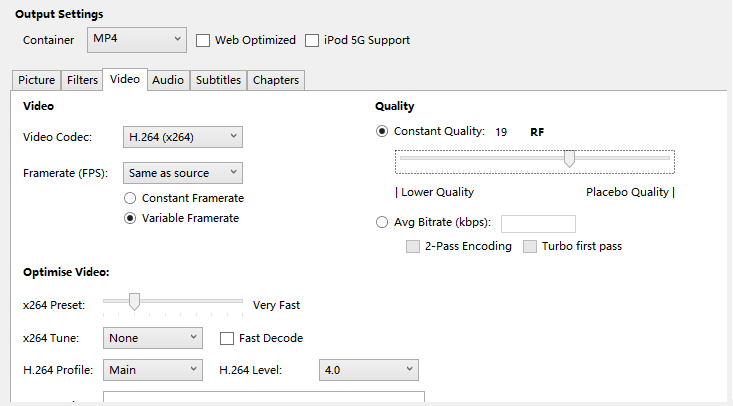 Clicking the Format bar, from its drop-down list, select Plex most compatible playback format "H.264 HD Video(*.mp4)" under "HD Video" main category. Tips: Click "Settings" on the main interface to open "Profile Settings" window, here, you can flexibly choose or specify exactly the profile parameters including video codec, resolution, bit rate, frame rate, audio codec, bit rate, sample rate, channels, etc as you like to get better output video and audio quality for Plex. 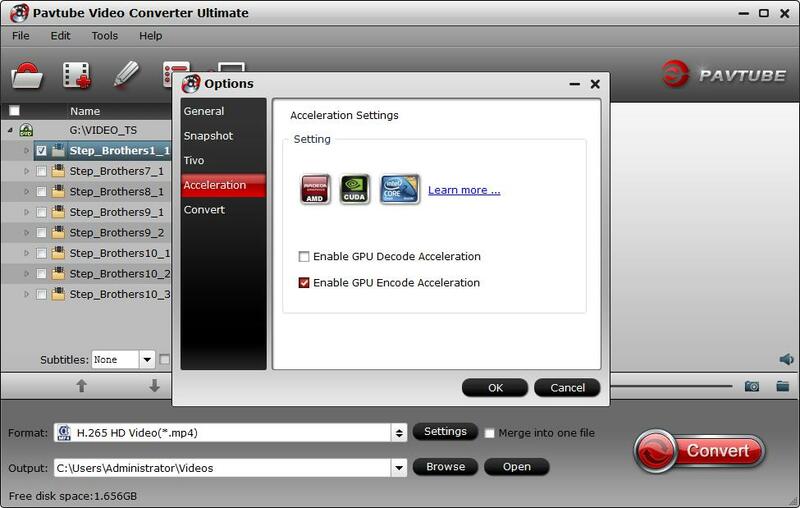 Step 3:Enable GPU Encode Acceleration. Click "Tools" > "Options", in the opened "Options" window, click "Acceleration" menu, then check "Enable GPU Encode Acceleration" otpion so that the program will accelerate converion speed when encoding Blu-ray/DVD/video to H.264/H.265 codec. After all setting is completed, hit the "Convert" button at the right bottom of the main interface to begin the conversion process from Blu-ray/DVD/video to Plex best compatible digital file format and profile parameters conversion process. When the conversion is finished, click "Open Output Folder" icon on the main interface to open the folder with generated files. Then feel free to stream the media files from the Plex Media Server to any of your devices.